I have a straight forward question I hope. We are trying to figure out which of these three are right/correct. 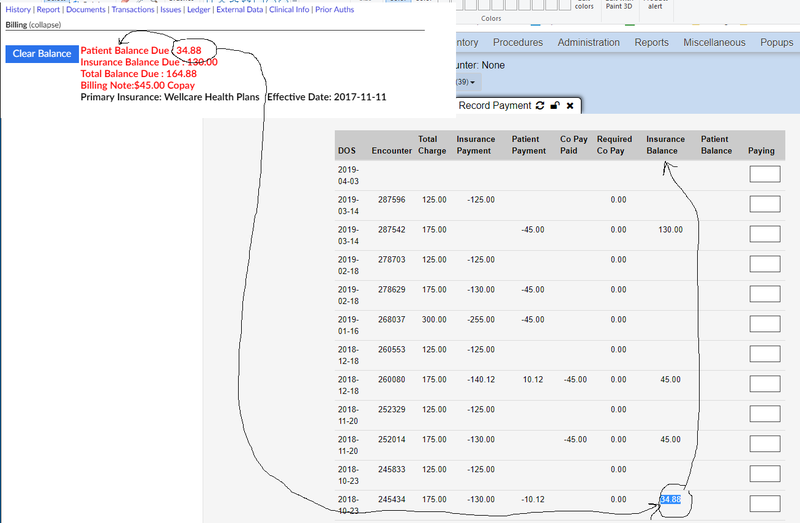 The payments show that it is an insurance balance. EOB shows that it is a patient balance. How could this have gotten mixed up this way? 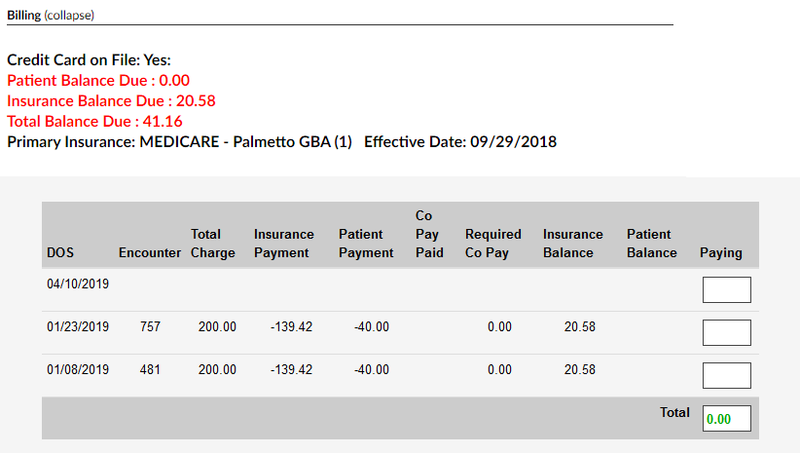 @sunsetsystems I know anything possible but do you have a theory on why the payment record would show the amount under the insurance and not the patient? // Ins1, Ins2 or Ins3. // Maintain which insurances are marked as finished. @stephenwaite Thanks for the response. I guess I should have posted the whole screenshot. In this case, the “Done with Ins1” is selected. Should the Now post for be changed? Is this the customer that has the pre paid then bill? @sjpadgett no it is not. They are humming along just fine. There is a patch to the system that I made that needs to go in the code base so I don’t have to carry it. However this is a different company in TN. It’s my season for popups out of nowhere. I wanted to ask before crawling into the code. I was hoping that @sunsetsystems would join the conversation. They have notice that there are six patients with this sort of things so it is not a one off situation. 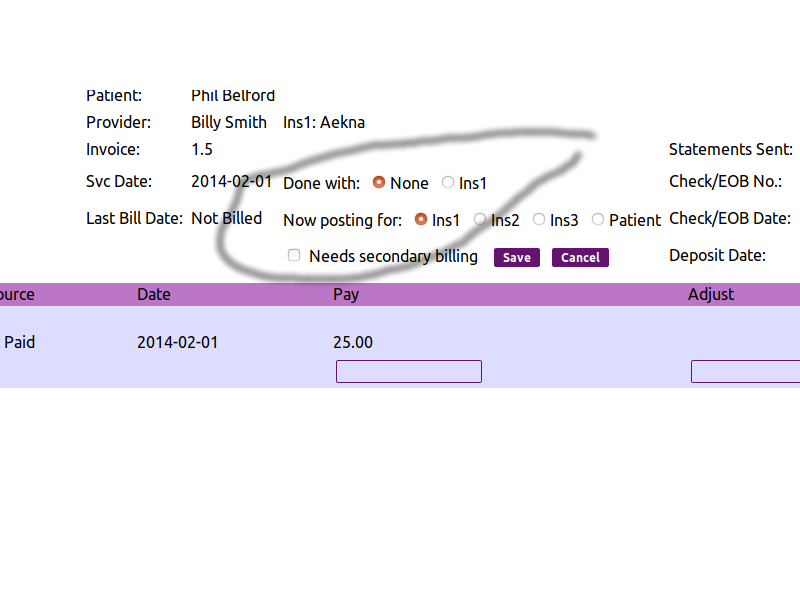 Sherwin, I remember some time back when I was helping you to figure out prepayments and why patient payments were not applied somehow to primary insurance that I made a mod to what patient payments were applied that would have impacted the billing report in summary and possibly not anywhere else ie posting etc. I bet that change is what you are seeing. I remember asking the forum how those payments should be applied to that report. I think in 501. I can’t check now but see if you can find that PR and you’ll see what I did. @sjpadgett I was looking through your commits. Do you remember what you named it or called the modification. Sorry I don’t know offhand, it would take some digging. I can’t find it. I was almost certain I mod’ed this. The demographics report come from ar table via patient.inc. @sunsetsystems Thanks, Rod. I just wanted to get some input before digging in to see where the problem lies. @stephenwaite appreciate your input and @sjpadgett don’t worry about your mods. I am sure I will run across your work. I’ll update this thread as I look for clues. You’d need to give context for the statement count as i’m pretty sure I didn’t add it. Also, I don’t think this mod solves the problem but masks it instead for this one billing context. Where in code have you done this? Not sure version oe you’re on but 501(7) has that statement at L-1905 however $ferow[‘stmt_count’] may be a flag where stmt_count may have been reset prior to getting here. I have to expend a few brain cell to find out statement counts purpose here but I think we’re in right place. @sjpadgett I looked through the code and the only other reference to $ferow[‘stmt_count’] was in the sl_eob_invoice.php and that didn’t shed any light. Maybe @visolveemr knows why the statement count was added to the patient balance calculation. I checked the 502 and the flag is still there. All the installs are the 5.0.1.7. I checked back to 5.0.0 and is there also. I think the routine expects if there has not been any invoices/statements sent then it would be safe to assume that the only patient payments due are copays. Last level billed should be enough. I’m leaning towards removing or figuring out a better test for if insurance is out or not. For now, I don’t see the harm in removing. Disclaimer: i’m always leery of second guessing original authors intent unless I fully understand. Here i’m using logic. We all know where that can lead me these days. I have written to Naina at capminds to see if that developer could shed some light on what the purpose of the logic.